Kay Thompson, born in St. Louis early in the 20th Century (1909 is the general consensus, but there is some disagreement), can be most easily be described as unique. On-screen she is remembered for her role as vibrant, sophisticated Maggie Prescott in Funny Face (1957), shown above, but Thompson was a woman of many talents: singer, composer, vocal coach, actress, comedienne, dancer, choreographer, author and clothing designer. She is perhaps best known today for the series of best-selling "Eloise" children's books she began writing in the mid-'50s about a precocious 6-year-old who lives at New York's Plaza Hotel. Kay Thompson was born Catherine L. Fink, the daughter of a St. Louis jeweler...and she was always musical. She began her singing career straight out of college and by the time she was in her mid-20s she was working in radio as a singer and choral director. She toured with Fred Waring as a singer and arranger, and her group, The Kay Thompson Swing Choir, appeared in Manhattan Merry-Go-Round (1937). Through songwriter friends Ralph Blane and Hugh Martin, Thompson became a vocal arranger at MGM in the early '40s. Her projects included Week-End at the Waldorf (1945), Ziegfeld Follies (1946), The Harvey Girls (1946) and Good News (1947). She had a small part in another of her assignments, The Kid From Brooklyn (1946). Thompson was also vocal coach to the stars: Sinatra, Garland (who named her Liza's godmother), Lena Horne (who termed her "the best vocal coach in the world"), Ann Sothern, June Allyson and others. Critic Rex Reed has remarked, "Kay did things with June Allyson, who didn't have much range, to make her sound great in Good News." 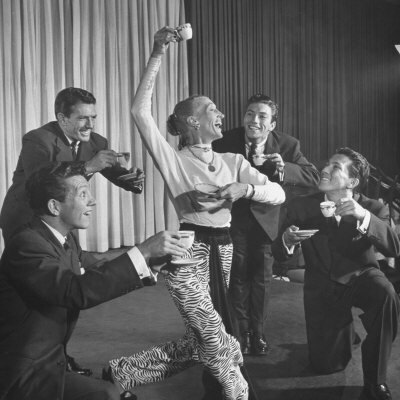 In 1948, when her MGM contract was up, Thompson left the studio and formed a ground-breaking nightclub act, Kay Thompson and the Williams Brothers (Andy was one of the brothers). It was a trend-setting smash. Singer Julie Wilson recalled Kay's show, "Her act at the Persian Room was electric. Kay and the Williams Brothers moved so well, with one terrific pose after another. It was an absolute knockout. Kay's energy took your breath away. She wore those wonderful white pantsuits, which no one wore at the time. The show was very stark and modern, and the rhythm never stopped." A critic from Variety reported, "Her act is paced like a North Atlantic gale," and concluded, "Miss Thompson is more than an act. She's an experience." Andy Williams remembered, "It's hard to imagine there wasn't an act like us before, because there have been so many since. Up to that time everyone just sang around a microphone, and when the song was over, the singers would raise their arms...[Kay] wrote wonderful songs, she could arrange, she could play the piano beautifully, she could stage numbers. And she could sing! She taught me more about singing and show business than anyone else in the world." Her show-stopping turn in Funny Face was Kay Thompson's only major film role. Her next and final outing was a small (but memorable) part in Otto Preminger's Tell Me That You Love Me, Junie Moon (1970) starring goddaughter Liza Minnelli. During her final years, Thompson lived in Liza's Upper East Side penthouse; she passed away there in 1998. In 2003 Disney produced two movies for TV based on Thompson's first two Eloise books, Eloise at the Plaza and Eloise at Christmastime, both starring Julie Andrews as Nanny (the first Eloise book had originally been adapted for TV in 1956). In 2006 an animated TV series based on the characters from the Eloise books debuted on Starz! Kids & Family with Lynn Redgrave as Nanny. Following Thompson's death, her estate authorized additional books in the Eloise series and several have been written and published since. "Liza's at the Palace...!" was a limited-run engagement at New York's Palace Theatre from December 3, 2008 - January 4, 2009. Included in the concert was a recreation of Kay Thompson's nightclub act. The NY Times critic wrote, "From the moment Ms. Minnelli joins forces with a male singing and dancing quartet to resurrect part of a famous nightclub act Thompson created in the late '40s and early '50s with the Williams Brothers, the Palace Theater blasts off into orbit." 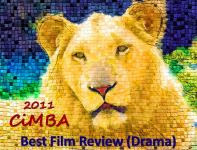 The show was a popular and critical success that won several awards including a Tony for Best Special Theatrical Event. 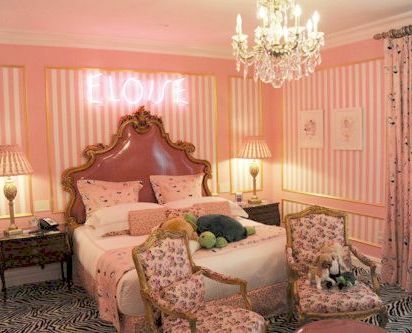 And - on yet another front, New York's Plaza Hotel opened an Eloise boutique in 2009 and in 2010 opened the Betsey Johnson-designed confection called "The Eloise Suite." Think pink, indeed! Sam, So glad you like all too my brief account of Kay Thompson's life, career and ongoing influence. I'm also happy to learn of your book - I've long been fascinated by the incredibly gifted Miss Thompson and look forward to reading her full story. Thanks! Fascinating tribute Eve. I am not familar with her name but the works and people she was associated with are amazing. What a career and a talent! Great stuff! John, It's a pleasure to introduce you to the dynamo known as Kay Thompson. There are those who gain more acclaim than seems warranted while others, like Thompson, deserve to be much better known than they are. She surely earned kudos from those with whom she worked - some of the greatest stars of the 20th century. It's been said that the impact of Kay Thompson on those she coached is clear if one watches and listens to them perform before and after they worked with her. Every time I think of Andy Williams I think of Branson Missouri. My ex mother in law tried to drag me there years ago to see him. Page, Kay Thompson worked with such a variety of performers - Sinatra and Horne are smooth and sophisticated, Garland is 100% show biz (in the very best sense of the word) and Andy Williams, at his peak, was the height of M-O-R (middle-of-the-road). And she served every one of them well. Eve ~ thank you for re-posting your tribute to Kay Thompson here. I read it after you posted the link to Classic Film and TV Café, but I think Kay deserves numerous reminders of her enormous talent and intriguing life. I hadn’t realized that she was, in fact, Liza Minnelli’s godmother or that she was THE Kay Thompson who wrote the Eloise books. I enjoy watching "Eloise at Christmas", well, at Christmas, and I think every little girl should have a pink bedroom similar to the one Betsey Johnson designed (for that matter, girls of every age can thank Kay for encouraging them to “think pink!”). Thanks again for remembering a woman who created an endearing and enduring legacy. Lovely post for a very talented woman. I only knew her from "Funny Face" and much later discovered that there was so much more to her. Live entertainers are so precious - thank goodness something of her is preserved on film. Eve, fascinating article on a lady I knew very little about, except that she was so good in Funny Face. What a life she led! Best of all, people who worked with her had such fondness for her and praised her talents. Not a bad epitaph for anyone. Wonderful post. Thanks, Becky, good to hear from you. Yes, she received high praise and much love from those she worked with. 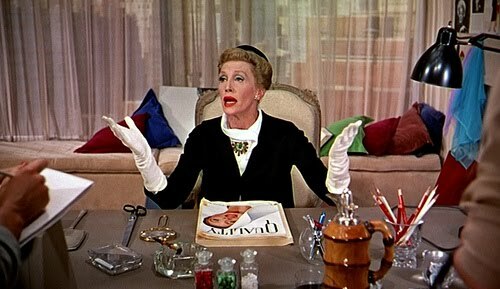 It occurs to me that had "Auntie Mame" been an enormously multi-talented show business character, Kay Thompson would have been a natural for the role. Eve, I missed this the first time around, so I'm glad you decided to revise and reprint this excellent profile of the unique Kay Thompson. It's a worthy follow-up to your recent post on "Funny Face." She's best known for "Funny Face," where as you pointed out, she steals every scene she's in--no easy thing when your costars are Fred Astaire and Audrey Hepburn! But I especially appreciated the photos of Thompson in her other guises. R.D., Several comments on my "Funny Face" post referenced Kay Thompson's star turn which is what prompted me to reprint this piece. There's no question that she deserves the spotlight - more than once. I looked for what I thought were interesting images to accompany and am happy to know you like what I chose. What an exuberant and multi-talented person she was! Thanks Lady Eve for highlighting her amazing career. Among other things, she was one of the judges of the Coty Award in American fashion, when Adrian won his first "Citation of Honor" for his V-Line suit in 1942. Christian, Thanks for that additional bit of background on Kay Thompson. Clearly her career was (even) more multi-faceted than covered in this post. Wonderful tribute. I recently showed "Funny Face" to a class and everyone wanted to know why Kay Thompson hadn't made more movies. I wish I had this tribute to show to all of them! CFB, I wish I knew why Kay Thompson didn't appear in more films. With all her talent and energy, she seemed to have a led a busy and varied life, I just wish movie roles had gotten more of her time. I love Kay Thompson. She had so much pizazz. She practically steals FUNNY FACE away from its two stars. I love the Think Pink number. She was such a hoot. I too wish she'd made more movies. She was the sort of dame it would have been great fun to know and hang around with in the good old days of NY theater. And to think, with her busy show biz life she still managed to write a childrens' classic. Amazing woman. Yvette, I liked the Variety reporter's description of Kay Thompson's nightclub act as "a North Atlantic gale" and have the idea that the pace of the rest of her life may have been the same. By the way, I read somewhere long ago that Eloise was supposed to have been based on Liza Minnelli as a child. PS--Eagle-eyed style watchers will note just how tricky Kay is with that fabulous brooch of hers...it is literally worn on every outfit in Funny Face, but never the same way twice! Genius! I'll be watching for it too. Who knew? Eve, I'm sorry I missed your wonderful "One of a Kind: Kay Thompson" post the first time around, so I'm absolutely delighted that you gave an encore performance! I fell in love with the ELOISE books when my dear late mom bought them for me when I was in kindergarten (as did my little Shugie. OK, so now she's 14, but to me she'll always be my little Shugie! :-)), and from then on I practically thought of The Plaza Hotel as my second home! :-) But I was really wowed with Kay Thompson's amazing array of talents when Mom explained that she was a singer/performer as well as a delightful author. Your post really put a smile on my face -- beaucoup kudos to you, my friend! Dorian, I was introduced to the Eloise books as a child, too - but it wasn't until many years later I found out the author had many talents in addition to her writing. This is a woman who deserves the be the subject of a musical or one woman show or mini-series - or something...very happy you enjoyed this piece. Eve, I remember enjoying the original version of this post when you did it at the Cafe. What a multi-talented person Kay Thompson was! It was fun to read again. Hi Rick - Yes, it was one of my "Underrated Performer" entries at the Café and first posted nearly two years ago. The revisions have all been minor (I can never stop 'tinkering') and it's great that some of you who've read it before also enjoyed it the second time around. It seems Kay remains as enchanting as ever - the references (in "Comments") to Sam Irvin's bio have already prompted two purchases! What a wonderful read, Eve! I'm ashamed to admit it, but I had no idea Thompson was the original author of the Eloise books. She was a truly talented woman. Thanks, Kim. 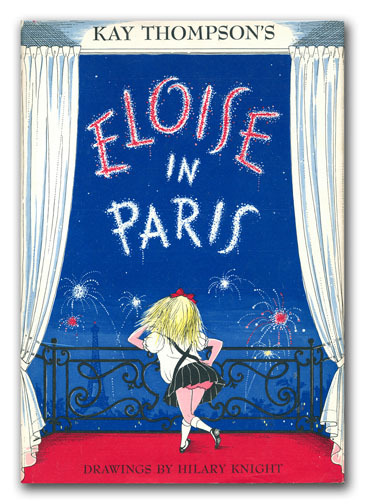 And don't feel any shame for not knowing Thompson wrote the Eloise books - she was so busy and creative in so many arenas I don't know how anyone (but a biographer) could keep track of everything she was up to. I just learned it was Thompson who helped Marlene Dietrich create her nightclub act. Makes sense that Dietrich turned to her, Thompson had a reputation for putting acts together and was then earning top pay as a nightclub performer. Dietrich would soon be earning the highest fees in the world for her own cabaret and concert appearances. Terrific post on a one of a kind lady. So many talents, I suppose it was hard to channel her energy into one thing, so she split off like a sparkler in all directions. "Think Pink" number is one of my favorites. Have read about her nightclub act, wish I'd seen it. I think her "Kay Thompson's Jingle Bells" came out of that act. Thanks for the link. I'd never seen that clip. Such a vibrant personality. I really enjoyed reading your awesome article on the very talented actress, Kay Thompson. The classic film, Funny Face, is my favorite performance of hers. I love the designer Betsey Johnson. I used to wear her clothes designs clear back in the 70s. Dawn, Did you really wear Betsey Johnson back in the day? She is apparently still going strong. Wonderful to hear from you. Kay Thompson was probably the most influential popular musician of the 20th century. Her style defined class and the way it should be done. I really enjoyed reading your article.